Who would ever have thought a three wheeled scooter would ever catch on? Even if you thought it was a good idea you could never have predicted just how successful it would be in the city where the latest revamped model was launched. Paris is a city of beauty, it’s also very congested and the roads are still mostly cobbled. Riding a scooter is a right of passage but inevitably those slippery cobbles help to raise accident levels. In 2006 Piaggio launched the MP3, a twist and go scooter with twin front wheels and a tilting body. I rode one in London for the first time and was instantly hooked, this thing really works well. 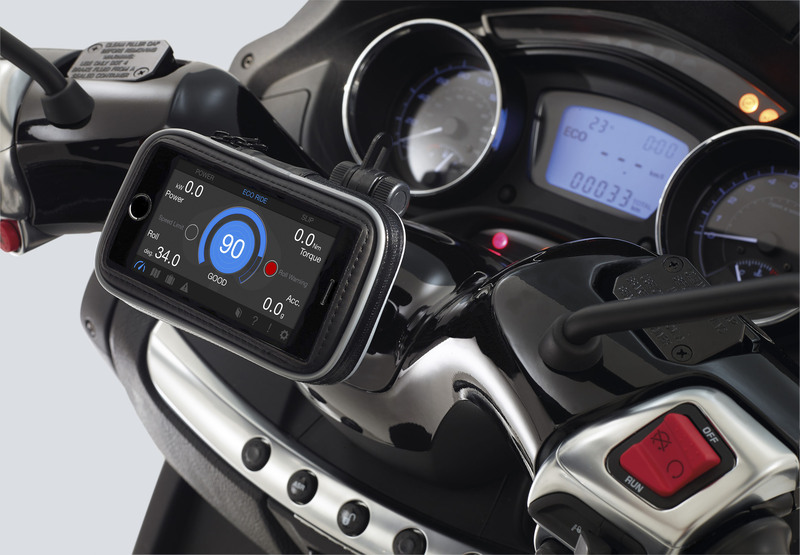 The great thing about an MP3 is that you have all the benefits of two wheels and although the extra front wheel adds an extra element of safety it also means if you’re the kind of rider who likes to push on a bit it means you can ride at 100% pretty much all the time. It laughs in the face of loose gravel, water and less than ideal surfaces. 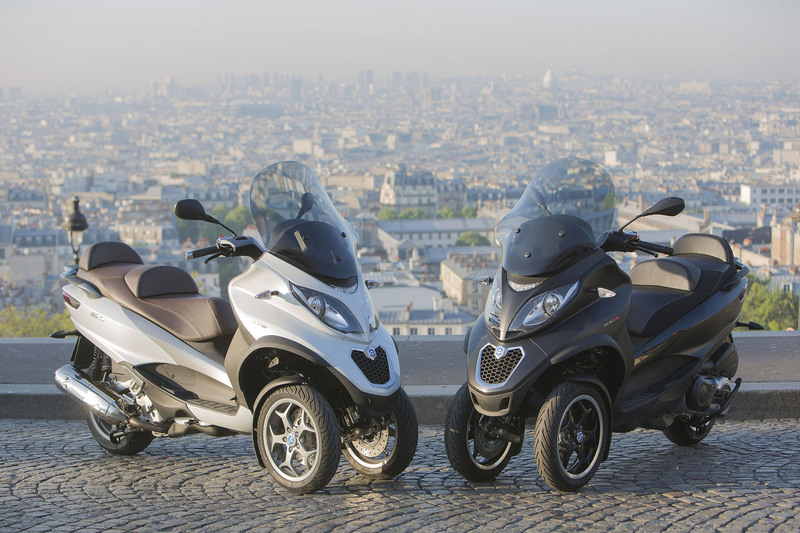 The French quickly adopted the MP3; they bought it by the thousand and have consumed almost half of the 150,000 units Piaggio have produced since it’s initial launch. There are over 70,000 Piaggio MP3’s in France, most of them in Paris. 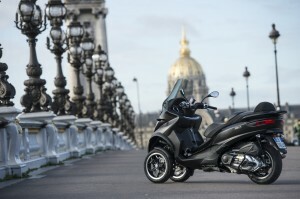 Which makes it the natural city of choice for Piaggio to launch the latest version. In a taxi from the Euro Star to our hotel a few minutes away we saw hundreds of MP3’s, more than we’ll ever see in a lifetime in England, unless of course our traffic jam inflicted car commuters suddenly wake up and realise there is a way of getting to work in less than half the time and they won’t even need a bike licence to ride one. Thanks to its LT (Large Track) front wheels the MP3 can also be ridden on a car licence, a loophole that greatly increased it’s target audience. 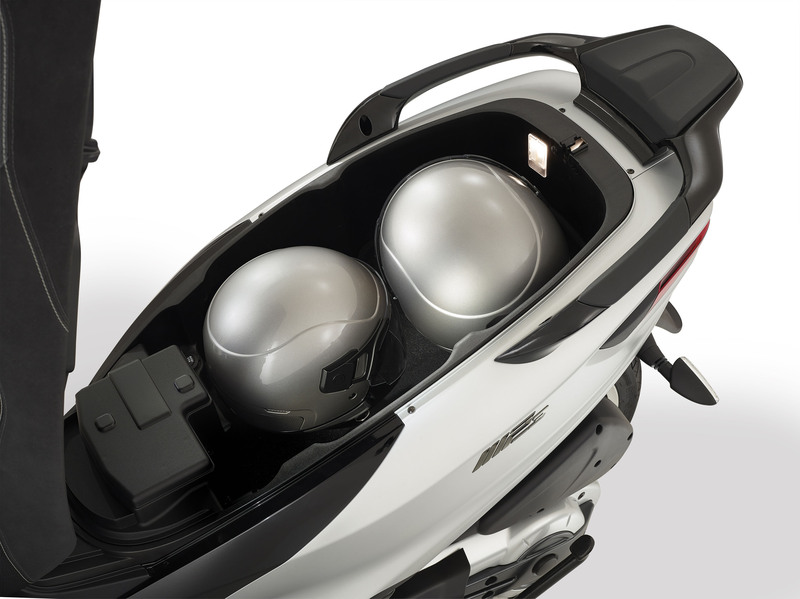 Visually the new MP3 hasn’t changed too much, other than the separate rear boot being changed to a more conventional space beneath the seat (it comfortably swallows two full faced helmets. This has also allowed the sumptuous dual seat to be redesigned for rider and passenger comfort. The rear lights have become LED, there’s also a front LED running light and the wheels have been changed from 12” to 13” at the front, 14” at the rear. They have also been restyled and will no doubt become the next mod of choice for the Vespa GTS rider (Yourban and MP3 wheels are already popular aftermarket accessories for current owners). 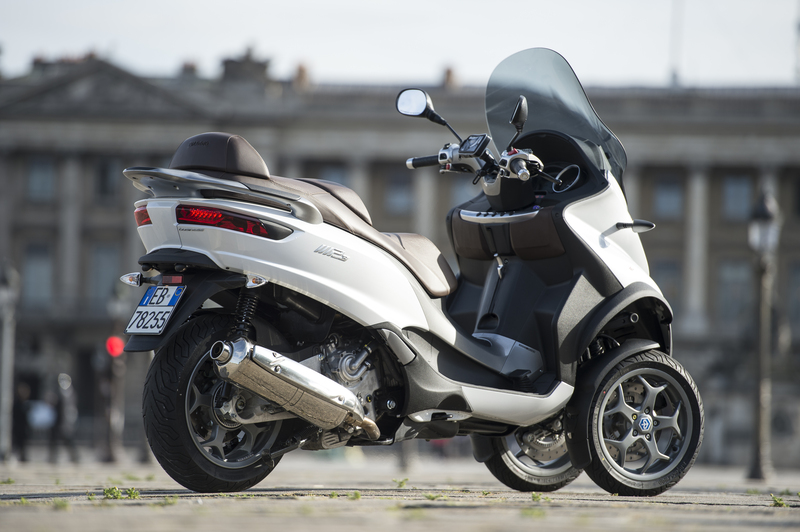 The twin spark 493cc Piaggio Master engine remains largely as it was other than gaining switchable mapping (normal and eco modes), 15% better fuel economy, ride by wire throttle and of course the Anti Slip Regulation traction control (ASR). It’s also quieter than it was and produces less vibration. The engine makes just over 40bhp, goes well and is reliable. If you’ve never ridden an MP3 you really need to try one (most Piaggio dealers will have a demo for you to sample). 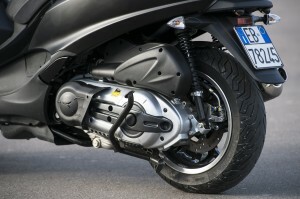 They have all the benefits of a traditional twist and go scooter but the added bonus of that extra wheel means you can lean harder in less than ideal conditions, you can take a shiny cobbled corner at full tilt, full throttle and let the rubber dig in and the ASR take over if the brains of the scooter think you need it. ASR does cut in quite often when riding hard on these kind of surfaces, never really when I thought I was in any danger of crashing but it’s an added safety feature and you can switch it off if you do want to enjoy things a little more naturally. The MP3 also has great suspension so those cobbles (or potholes back home) don’t upset things too much. The brakes are fantastic as well, a disc at each front wheel and a single rear that can be operated independently using the front levers or linked by using the foot pedal, a necessary item for the MP3 LT to comply with legislation. 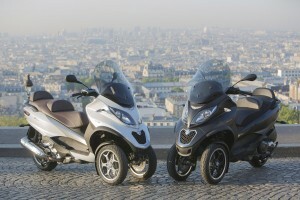 Although the scooter may have some safety measures built in you can still ride it like a sports scooter and you can certainly have fun on it, there’s no need to back off when you see slippery roads, in fact they become a playground where you hunt for the areas you’d normally be scared to ride across. One thing you’ll all wonder about an MP3 is whether or not you can filter on one. If you’ve ever been to Paris and seen how busy it is you’ll realise that the French would never have taken to three wheels if you couldn’t get through gaps like you would on an ordinary bike or scooter. 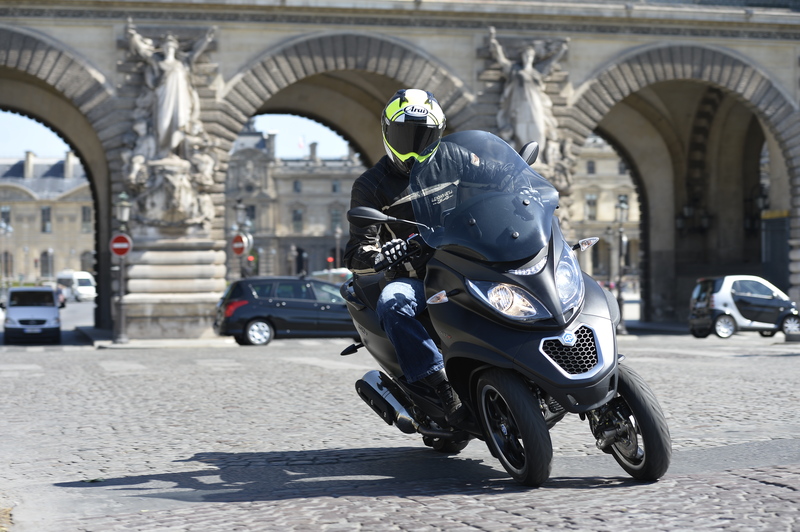 An MP3 is no wider than a maxi scooter and once you’ve got used to the slow speed stability, the way the wheels track as you’re coasting through traffic at walking pace and the ease with which you can manoeuvre through gaps you’ll realise just how good this machine is. Stopping becomes a game of never putting your feet down, simply get to around 5mph, press the button near your right thumb and the body will lock. Twist the throttle once the lights change and it unlocks automatically. It accelerates very well too, nothing outran us in Paris.